It’s not a resolution per say, but with all the organization buzz this month I decided to try and really improve my HMS. That’s Household Management System. Using an acronym makes me feel important, try to go with it. After extensive research, my kitchen command center was born. Since the kitchen is where papers pile up and where people tend to congregate, the counter was the perfect place. The command center consists of a pretty pink notebook for me (more on that in a bit), a file folder box, hanging folders, a calendar, and a pen/pencil cup. Each one of us has our own folder, plus there is one for new unsorted mail. No more stacks on the counter! My notebook fits in neatly as well, and the calendar lets us know what’s going on at a glance! In my notebook, I have a daily task and a weekly task sheet. I downloaded these from Simple Mom, she has tons of useful forms here. Instead of printing them out every day or every week, I put them in sheet protectors and use wet erase markers to fill them out and erase them as needed. Part of my organization goals includes meal planning 2 weeks at a time. Every day I write down what’s for dinner, so I don’t freak out at 5 wondering what to make. I keep favorite recipes and coupons in the notebook as well. 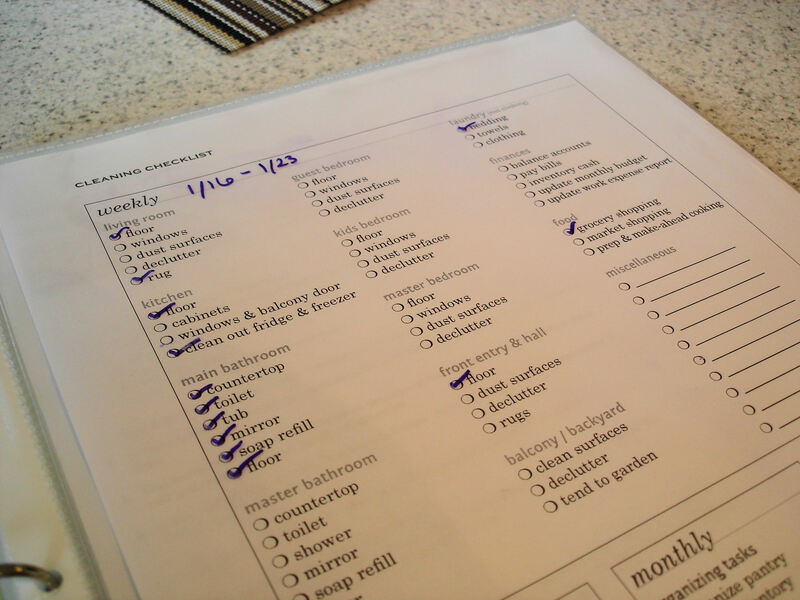 The weekly task checklist helps me keep track of household chores. It’s easy to get overwhelmed with all there is to do, but seeing it on a list and checking it off makes it more manageable. What about you guys? 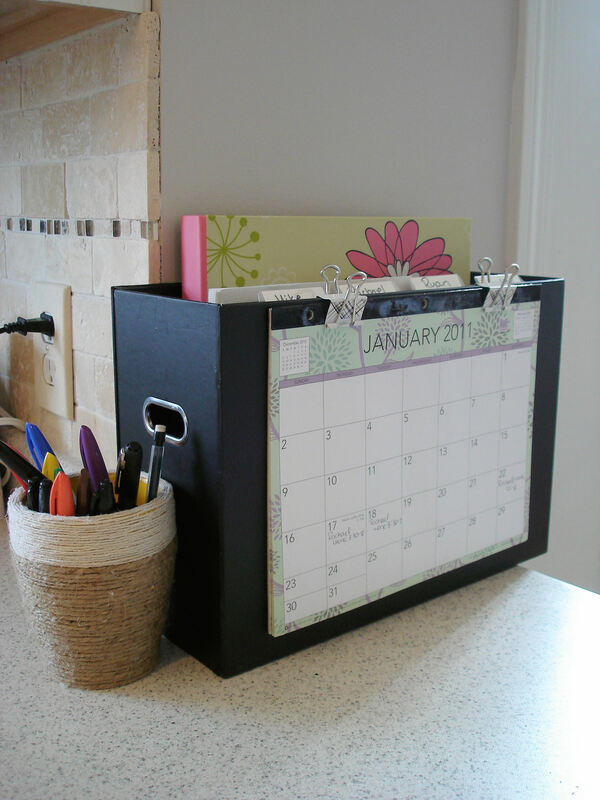 Are you getting more organized this year? Have any tips and tricks to share? Basement Progress- A Craft Corner For Me! Good morning!Come on over to my blog and see that I awarded you as a stylish blogger…basically your on the top 15 every morning I read 🙂 Have a great day! I bow down and worship at the alter of your organizational skillz! Wow, I agree with Amy and bow down to your outstanding organizational skills! And could you share that Hawaiian Chicken recipe please! Sounds tasty! I was just about to make a command center in my home. I have been keeping an eye out for a cute file box. Any suggestions on where I should go? Missy- I got mine at Office Max, but I think they have some cute stuff at Staples and Target also! I would love to know wher you found that file box also. I believe it was Office Max, but it was so so long ago – sorry! I love it to and came back a few days after I originally saw this post to see if you had shared. When I saw the 2011 date I was disappointed. Hoping my online search won’t take too long to find something!! Love it! I plan on making a similar command center as soon as my decide-if-I-graduate-grad-school-huge-exam is over next Wed!!! What is the dimensions of the file folder box? Glad to pass on the inspiration Tanya! Ahhh, organization. It feels so good when it’s successful. The papers are the hardest part at my house! I’m inspired to re-commit to stop piling them up! Great idea to use sheet protectors. I print my list each week but I need to start doing this. Thanks for sharing. Saw you at Fingerprint on the Fridge. Very nice organization ideas. Love the wet erase markers idea, very very clever. Love you blog BTW and will be coming back again. Hello! I found a link to this from Pinterest. I’m doing something similar to this, but yours looks way prettier… so I guess I am going to have to make a trip to the store soon. 🙂 Thank you for the wonderful ideas. Hi! This looks awesome! I host a weekly blog hop at It’s a Keeper. I’d love for you to stop by and link up! Hey I saw this link from Pinterest and I really like your system. Was just curious… I love that file box! Where did you get it from? I LOVE IT! Thanks for the awesome idea!!! I love this idea and just posted a link on my blog! Happy December! I also plan on being more organized for 2012 and I must say… Your command center looks like just what I need! I will definitely be getting started on that! Thank you Tina! Good luck with your resolution, I need to have more resolve in that area as well! I am so excited! I can not believe I never thought of this!!! I do this for my kids speed drill test, but never thought of it for myself!!! Thank you Thank you Thank you!!!! HELP I went to Office Max, Target, Walmart, KMart, Metro Office Supply and could not find the file box or anythig close to it! Is there anyway you could tell me the brand of the box or possibly the product number!! I am so wanting to get my kitchen counter oraganized and I love, love this idea! Niki- Sorry there aren’t any markings on it 🙁 There are always cute options though, I have seen some nice stuff lately! Just a thought … You could probably make your own fabulous box. Love this…found it on Pinterest! Where did you find your cute calendar or did you make it? I got the calender at Office Max! I’m totally doing this…I love it…thanks for sharing this simple but oh so clever idea!! I just created ours yesterday, after the much-anticipated file box arrived. Thank you, thank you, THANK YOU for creating a system we, as a household with a new baby, can embrace and grow with!!! What sort of things do the other family members use their files for?? Leighanna- We mostly just use it for mail sorting, but there are endless possibilities! I have notebook that has a section for each person in the house. Their sections include school information, and the like. I also have a section for chores, calendars and menus. Just recently I added a section for coupons. I keep all of our information (important documents) like id cards, ssi cards, etc. That way if there is ever an emergency (like fire or tornados) we can just grab the book and go. I also have a board that hangs next to the kitchen door that has a place to put mail (we put bills in it as they come in), a bulliton/message board and a chalk board for the nightly menu. I bought it at the Goodwill for $2.00! So far this system has worked really well for us. But I like the idea of a command center too. 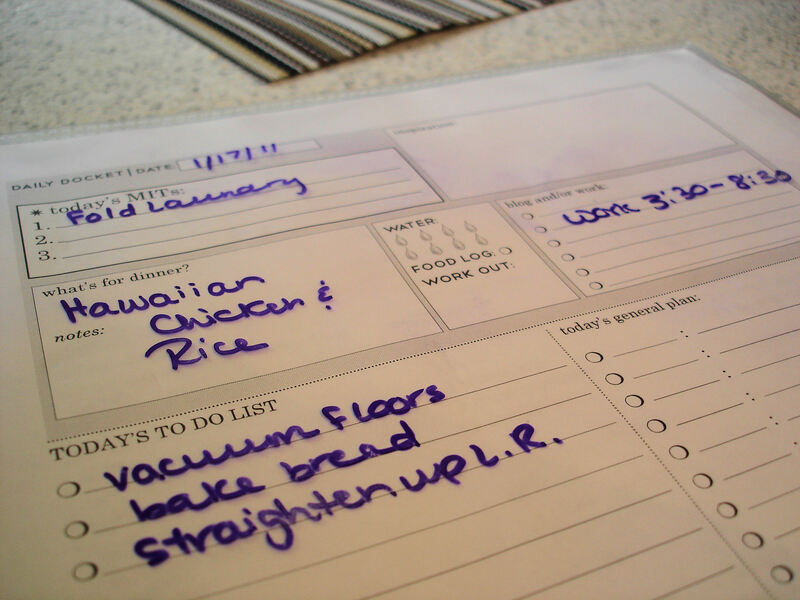 This is a fantastic idea – I have notes and to do lists jotted all over the house, and never in the place where I actually need them to be, so I may just have to try this out! Where do you find the templates for those sheets? I’ve searched for that file box everywhere! There’s one like it at Target, but I think it’s much bigger, and would be too big for a kitchen counter. I’m trying to compare the depth of the box, or distance from front to back (my husband says that’s the width…but I think it’s depth). If I made any sense at all, would you mind telling me what is the depth (or width?) of your box, from front to back? It’s about 4.25″ deep, hope that helps! Hey there! I just found your blog via pinterest. I LOVE this idea! I’ve been meaning to make something like this. Even though it’s just my husband and I (as we don’t have kids yet), things get very hectic! 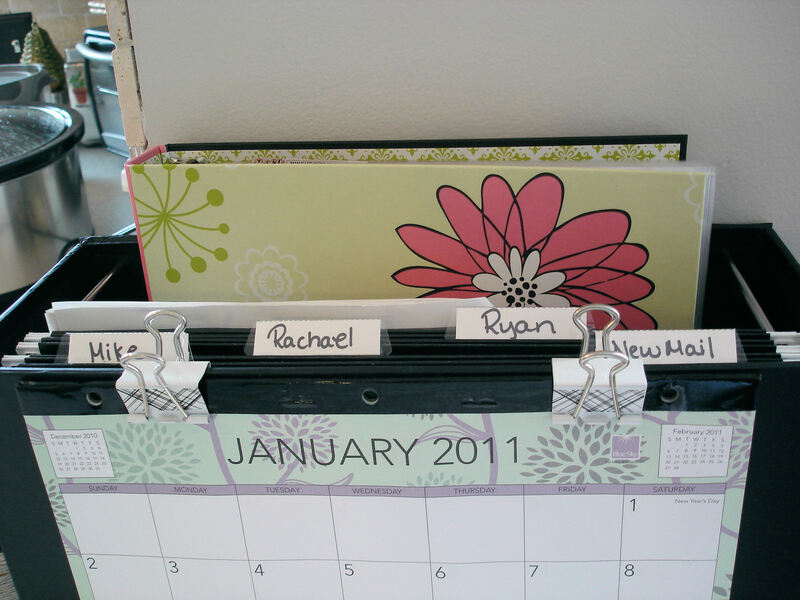 I love the idea of using the dry erase marker and that everything is in one spot. We’ve been trying to re-budget and I’m thinking I could some how incorporate this into this project…THANKS! I just found this only pinterest and holy Martha Stewart, this is probably the best idea I’ve pinned in months. Our kitchen counter is ground zero for the disaster that is my house. This just made some dreams come true up in here. Thank you!!! Great idea! Even with the just the two of us now, the papers tend to stack up and this might be a great solution. Thanks for sharing! I have had this project pinned for ….well a long time…but I wanted to let you know it is brilliant! And I can’t wait to copy you! Your blog is super fun thanks for sharing! Thank you so much for your organization tips! Beautiful picture by the way. I love love love the idea of the wet erase pages! I feel like i rewrite those lists week after week. That makes so much more sense! I love the idea of everyone having their own folder too. It just gets so out of control! Thanks for the ideas. I love this idea! I need to work on my household notebook, it is rather out of control….as is our house right now! Happy New Year! I found your blog through Team Ibrahim and can’t wait to catch up and read more. Where did you find the cute file folder box? I like this idea. I found the perfect file box through Clever Containers at home party’s. They even have a “panic no more” set of file folders. We recently put our new computer in my daughter’s bedroom off the livingroom/diningroom/kitchen, so command center is going there. I write on my calendar what we eat for dinner each night. It’s not a meal plan but at least I have a historic reference. What a lovely, crafty idea 😉 I was just curious as to what things you put in the files. I love the idea of this command center, but I’m wandering if “we” need files for each family member or just more basic files, i.e recipes, outgoing/incoming mail, doctors/RX. We homeschool, so I have a whole room dedicated to the “school stuff” Thanks in advance. person’s blog link on your page at appropriate place and other person will also do similar in favor of you. Where did you find the box you used? Love this idea! With six people constantly on the go in my house this would be amazing! Thank you!! This is a great post. I have gone through about 3 stacks that were strategically hidden around my kitchen. I found duplicate bills, old papers, and things that should have been filed. I should have taken care of this when I picked up the mail! Thanks! I am curious what you use the personal folders for. This is a magnificent idea! There is one suggestion I have that’s REALLY IMPORTANT! We’ve had some robberies in our community because service people in the home looked at someone’s calendar and figured out when they weren’t going to be home. Sad story, but true. Hey, where did you get thaïs file folder box? I can’t find it anywhere?? Hi there, great idea! Im interested in the cleaning checklist however the link no longer works. Is there another one? Brilliant idea! I’ve been seeking this style of organization for a month or two now – thank you for your mindfulness, Rachael! Unfortunately, the “Simple Mom” website doesn’t seem to exist anymore. Might you e-mail to me as many of “Simple Mom’s” forms that you have, please? I’d be absolutely delighted! Lea – I know it’s been a while since your comment, but I just tried the links in this post and it took me to the blog with the forms. It has a new name now – theartofsimple.net, but the forms are still there! Thank you for sharing all these organizing techniques! I have a question , where did you purchase the file folder holder? Hi Arlene – a loooooooooooong time ago at Office Max I think! The forms aren’t available as the website is no longer up? Any idea where I can get so etching similar? Oh bummer! I would search on Pinterest!